As ubiquitous as a cup of tea can be, in many places all over the world it holds great cultural significance. Despite its colonial history, tea is the most consumed beverage in the world besides water. From the way it is prepared to the way it is taken and how it is served, the cultural traditions of tea vary around the world. SHAAZIA EBRAHIM and FATIMA MOOSA round up seven of the worldâ€™s most unique tea traditions. Brewing and drinking tea is a tradition that signifies hospitality and friendship in Morocco. Tea is prepared before guests in a demonstration known as atai. Itâ€™s often prepared by the male head of the family and considered an art passed down through generations. Traditionally, the tea is prepared in a samovar (heated metal container traditionally used to heat and boil water in Russia) which brews strong, highly concentrated tea. A Chinese gunpowder variety of green tea is usually brewed, sweetened with sugar and flavoured with mint. It is served on trays in ornate teapots, poured into small crystal glasses. The teapot is held high in the air while pouring the tea into the small, delicate glasses. The tea is only considered drinkable if it has foam on top. If there isnâ€™t foam, the tea must steeps for longer, so it is poured back into the pot. Sometimes, the method of pouring and returning the tea to the pot is used to mix the ingredients and is part of the ritual. This flamboyant art is made possible by the long and slender curved spout on the Moroccan teapot (and a lot of practice). Butter tea or Po cha in Tibet, is made from churning tea, salt and yak butter. Itâ€™s made using a potent, smoky type of brick tea from Pemagul in Tibet. Some of the brick tea is crumbled into water and boiled for hours until it makes a smoky, bitter brew called chaku. This brew is stored and used to make butter tea. To make Po cha, some of the chaku is poured into a chandong, (wooden cylindrical churn) with a hunk of yak butter and salt, and churned for a few minutes before serving. Some Tibetans consume po cha several times a day. Given the high altitude areas of Tibet, the drink is beneficial because of its warming quality and high calorie count, which keeps energy levels up. The butter fin the tea helps prevent chapped lips â€“ common in Tibetâ€™s windy, exposed steppes. The tea also supposedly aids digestion, keeps the mind focused, and promotes a healthy cardiovascular system. Masala chai is woven into the fabric of India. Its not uncommon for people to drink an average of about four small cups of chai per day. Chai is made by made by brewing black tea with a mixture of aromatic Indian spices and herbs like cardamom, cinnamon, cloves, ginger and peppercorns with milk and sugar. Tea used to be medicinal in India but in the early 1900s, British-owned Indian Tea Association began to promote Indian tea consumption in India. Black tea was the most expensive ingredient, so vendors used milk, sugar and spices to keep their brews flavorful while keeping costs down. All over India, street vendors and train vendors called chai wallahs (tea persons) serve masala chai to the public. Chai is also used to welcome guests into the home. A Middle-Eastern version of masala chai is called karak chai and is prepared in a similar fashion. This beloved Senegalese tea ceremony can take up three hours to complete and it is an integral part of Senegalese social life.Â Ataya is a word from Wolof which is a native language in Senegal. It can take place at any time of the day and just about anywhere and presents an opportunity for family and friends to talk and catch up. The ceremony takes place in three stages which round taking up to twenty minutes. Every stage happen in a kettle which boils on a stove throughout the ceremony. A strong and bitter brew of Chinese green tea is made and then poured into tiny glasses called kas. The tea is then poured from glass to glass until a thick foam is formed on top. In order to achieve a thick foam, it is better to pour from higher up. Each stage of pouring follows the same stage but fresh mint and sugar is added as you go. According to Senegalese folklore, the first cup is the love of your mother, the second the love of your friends and the third is the love of your love. Also called the Way of the Tea, the Japanese tea ceremony is one of the most iconic ceremonies. 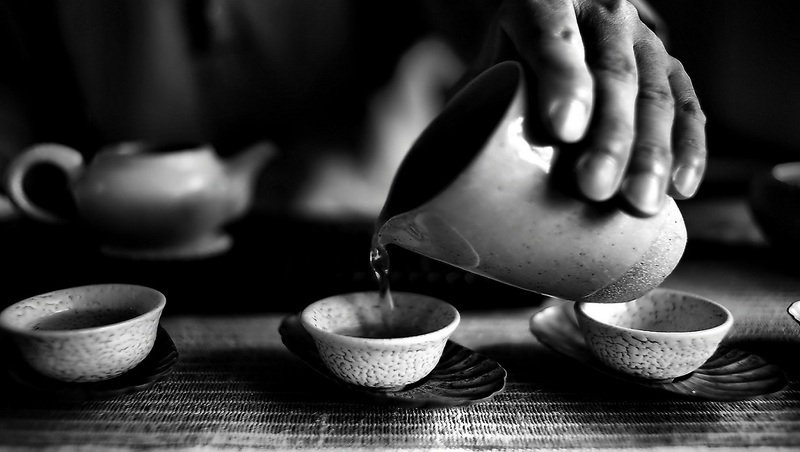 Chado, which is called the way of tea, is the ritual of preparing and serving green tea. It takes place in a room which is sparsely decorated with flower arrangements while guests kneel on cushions. The ceremony is rooted in Zen philosophy with the ceremony being a spiritual process where the participants remove themselves from the mundane world. Ground matcha and hot water are added to a bowl and whisk thoroughly. The bowl of the tea is then passed around to guests with each having a chance to drink. Noon chai, gulabi chai, Kashmiri tea or pink tea: the traditional tea beverage from Kashmir has many different names. It is a drink that is made with salt, milk and baking soda. The word noon means salt in many languages like Kashmiri, Bengali and Nepali. The word noon is also used in other terms in the Indian subcontinent such a noon-dab which is a Rajasthani salt promise. The tea is traditionally made from a special tea leaves, milk, salt and cooked in samavar. A samvar is a metal container which is used to heat and boil water. The container keeps the tea warm by burning a coal inside. The tea is drank two to three times a day. The tea leaves are brewed with baking soda until the pink colour of the tea is achieved. There has to be a correct measurement of the tea otherwise the tea will not turn pink. The pink tea is called tueth which is served with water, salt and milk. There is a belief in Kashmiri folklore that noon chai is refreshing in the heat and resisting the cold in winter. Yerba mate (pronounced yer-bah mah-tay) is an evergreen tree from the holly family which grows in the subtropical forests of Uruguay, Paraguay and the Parana state of Brazil. Its basically like English Breakfast tea for South American people, served when friends and family pop around. Interestingly, it has the same amount of caffeine as coffee but is a grassy infusion that tastes like a smoky green tea. Traditionally, the tea is drunk from a cup made of a dried and hollowed out gourd fruit. Loose yerba mate herbs are placed in the cup and moistened with cold water before simmering water is poured over the mixture and allowed to steep for five minutes. The tea is sipped through a bombilla (straw) which strains the herb. The herbs can be steeped over again and people carry flasks with hot water for that very purpose. Today, the tea has become pretty popular with many South American footballers being pictured drinking yerba mate.